Matcha powder is notorious for forming little clumps after it is ground, packaged, and shipped from Japan. These little clumps are impossible to blend in when whisking your beverage, and they will be an un-welcome presence in your bowl of Matcha. 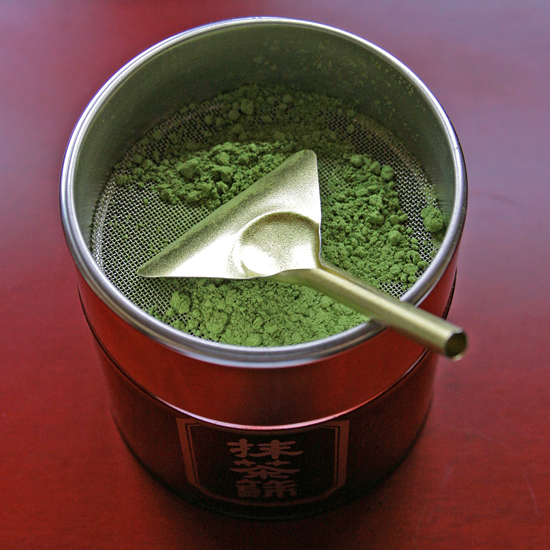 You can see the clumps of Matcha in the photo of the tea in the sifter. What to do? 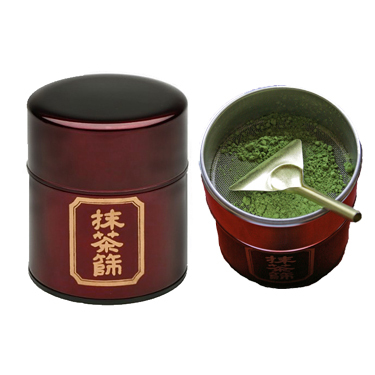 Do what Japanese tea masters do and sieve your Matcha powder to achieve maximum blend-ability and smoothness in your bowl of prepared Matcha. Simply put the desired amount of Matcha powder into the strainer and work it thru the fine screening with the little paddle. 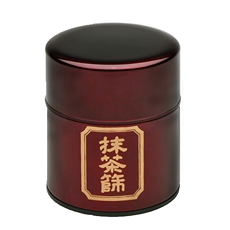 The tea powder will collect in the bottom of the tin. When you have sieved the desired amount, carefully tip the tea out with your chasaku into a tea container for storage, or directly into your chawan (tea bowl) for immediate whisking.